Full size mobile casino gambling tables and equipment available for hire with professional croupiers. Ideal for Casino or James Bond theme nights, private parties, weddings, corporate functions and events. Blackjack and Poker are a half circle 1800mm diameter, Roulette and Craps are a rectangle 2200mm long and about 1000mm wide. They're best placed in a corner or up against a wall so the dealer stands behind and the players out front. Blackjack and Roulette are by far the most popular as the games are quick, lasting only 2-3 minutes each and are the easiest to learn. If you’re planning a large mix of tables we would highly recommend at least half your tables be Blackjack as is normally laid out in a typical Casino. This option is best for when you want the casino to be the main entertainment. As guests arrive they are handed their “million dollar gold card” and can swap it for chips at the tables once they open for play. Then, when the tables close, guests return their chips for a voucher representing their winnings. You can either give a prize to the "Ultimate High Roller" who won the most, or perhaps have some prizes available for a fun auction where guests can bid with their winnings. It's a lovely way to make sure more people go home with something. Any of these options can be decided when you're ready and just discussed with the dealers on the night. This is the best option if you want the tables to be side entertainment and not all the guests will want to play. Guests get given chips when they sit down at the tables to play. Our gorgeous Showgirls can meet and greet your guests and be available for photo opportunities during cocktail hour. To make your guests feel like stars as they arrive! Get a couple of them to use modern digital cameras and display the photos later in the night on a projector or keep as a momento. Our talented Cartoonists can do individual drawings of guests for them to keep as a fun memento of the night. They can do roving entertainment and mingle with guests or you can set them up in a corner and guests can come to them. 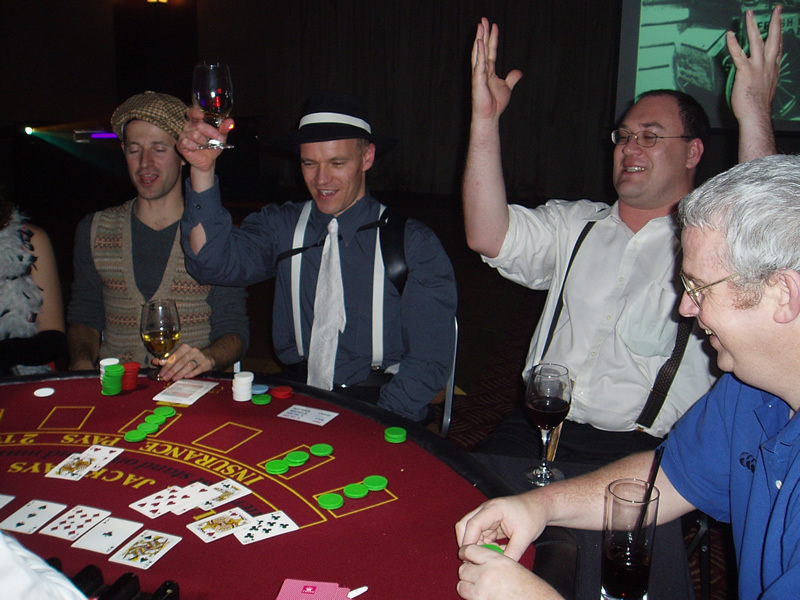 Our roving Magicians can perform close up magic to entertain your guests in true Vegas style. Our talented musicians can start the evening by playing Swing Jazz music or easy listening as guests arrive and during cocktail hour. We have a selection of the best DJ's who know how to cater to a corporate group or wedding receptions. There's plenty more variations we can make for you for other size groups or other ideas you'd like to do - these are just examples.